Home > Blogs > traceytf's blog > Workshops & Events HERE! Please click on the links to the left of this page for listings with full descriptions and registration. 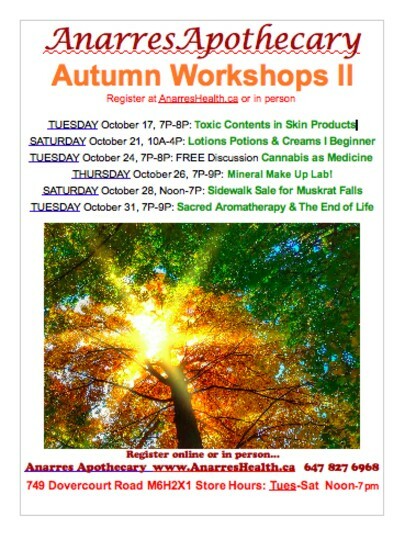 Anarres Apothecary www.AnarresHealth.ca 647 827 6968. Sun Protection Cream http://www.anarreshealth.ca/product/cream-sun-protection-zinc-30-50 and our NEW Cream or Yellow Shea Butters in Jars http://www.anarreshealth.ca/product/butter-shea-glass-or-metal-jars-now-... are 30 to 50 % off. Buy one Sizzling Summer item; get 30% off. Buy Any two; receive 50% off or get a second set FREE! August while supplies last! So for example if you order 1 Raindance Nighttime Renewal lotion. and 2 Raindance Hand & Body lotion, I will give you 20% off all three products, but not 30% all three. Make sense? If you are paying in store, by cheque or email transfer, wait until I adjust your invoice to pay. If you pay through PayPal, I will adjust your invoice, then refund you the same way you paid me. Remember, it's while supplies last, so order as soon as you can to avoid an ominous email of disappointment. This happened (see below). Did you miss it? Book the next one for yourself or a group! When I Dare To Be Powerful Workshop for Women with Penny Rosenwasser March 6, 1pm to 5pm What will make it irresistible for women to free ourselves of internalized oppression, expanding our sense of possibility? Workshop: Creating Your Green Holistic Health Business March 7, 10:00am - 4:00pm This workshop is geared to eco conscious holistic health entrepreneurs, massage and body work practitioners in their first years of business and are working towards sustainable, rewarding practices. * If you are keen to learn how to make body care products that are safe, from fairly traded, environmentally friendly ingredients. Are you new parents fully-gifted with a hundred products you're not sure are safe or useful? Afraid to give your nature-freak new mother friend/sister/daughter anything nice for fear it will be rejected for being unhealthy? 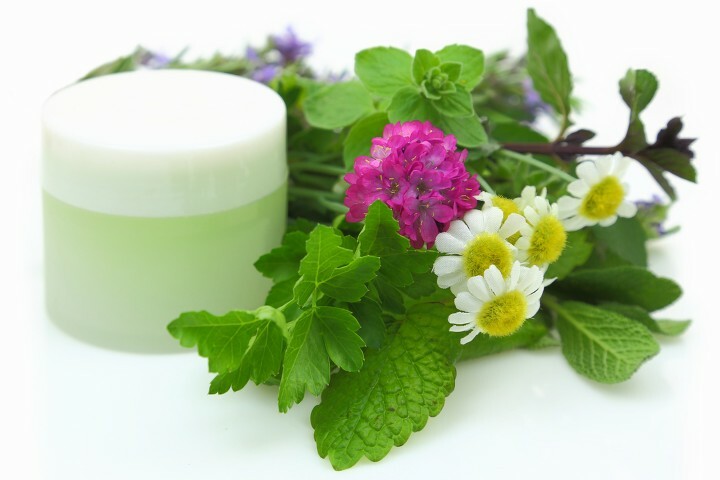 What essential oils and botanicals are safe and effective for the childbearing year? This month, learn to make Shea Butter Moisturizer with Shannon. Bonfire: Burn It! Grow It! 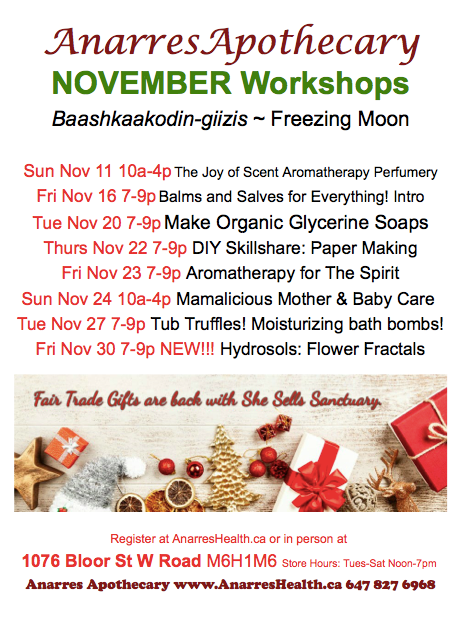 Workshop: Make Mojo Oils and Massage Bars! FRI SEPT 25 10A-4P All Sorts of Soaps! Create Your Own Magical Herbal Tea Blend! Choose from a variety of delicious, nutritious organically and cooperatively grown herbs, create your blend and iron it into nifty tea bags. A product is one dozen custom composed handmade tea bags, labelled and packaged in a windowed paper bag. Trade varieties with your fellow participants! Holiday Gift Making Labs! Saturdays Dec 12 & 19, 1-4pm. 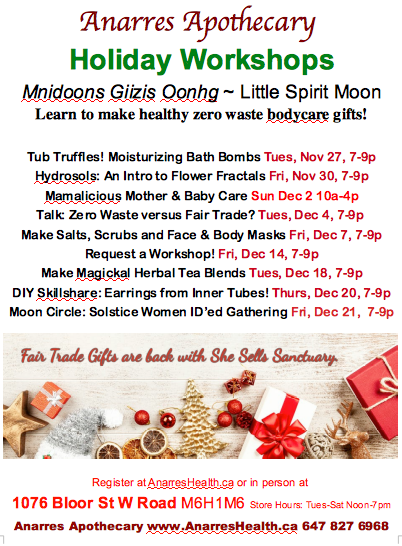 Make delightful natural products to give as gifts or to gift yourself! We'll be on hand to help you create a custom recipe and choose your ingredients. Create luxurious lotions, starting with a base made at Anarres, then choosing from a dozen carrier oils and dozens of exquisite essential oils, or compose a moisturizing cream using cocoa butter and shea butter. A product is one glass jar of cream or 1 custom lotion in a metal or glass bottle. Trade varieties with your fellow participants! 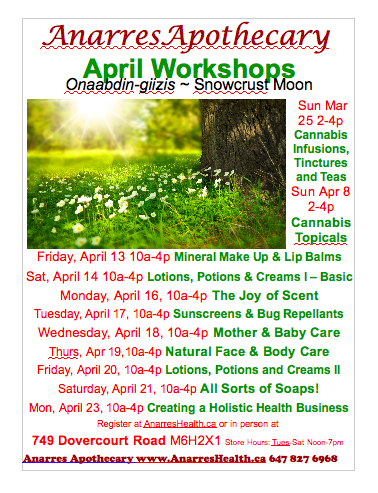 This hands-on workshop will have you creating nourishing concoctions with natural ingredients that are safe and effective for mother and baby. 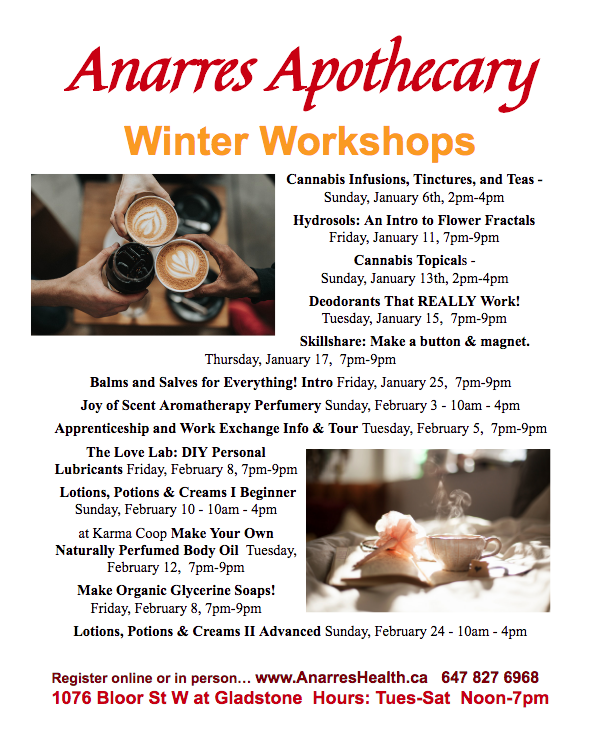 Thanks for checking out the upcoming happenings at Anarres. Bring a friend for free to ANY Anarres Workshop by Tracey by writing your friend's NAME and EMAIL in the Comments with your order.